When summer comes, salad is a very popular dish on our table. 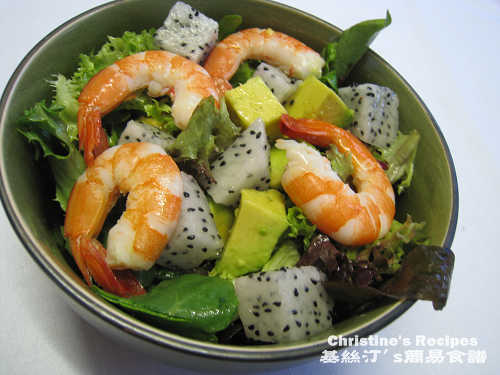 This shrimp and avocado salad is our family’s favourite one. In last summer, I added one more healthy and terrific fruit in it. Guess what? It’s dragon fruit, a very delicious and nutritious fruit. There are two varieties of dragon fruit, one with bright red flesh and the other white, both have tiny black seeds. I bought the white one this time, adding my salad a striking colour. Combine olive oil, lime juice and minced garlic in a bowl. If the shrimps are too big, chop them into halves. Toss in shrimps and coat with oil mixture well. Rinse lettuce and drain well. Arrange leaves of lettuce at the bottom of a large serving bowl or platter. 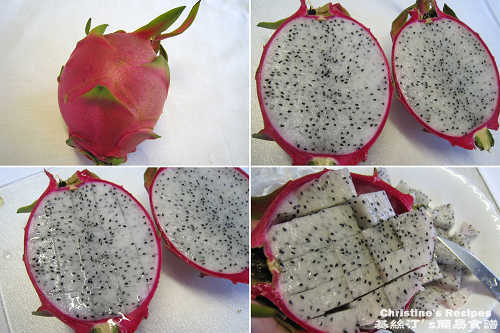 Cut dragon fruit in half (see picture shown above). Use the tip of a sharp knife to cut cubes. Spoon out the cubes. The middle ones might be too long, cut into half then. Set aside. Use similar method to cut avocado in half. I normally don’t use sharp knife to remove the stone of avocado. Instead, I just use a small spoon to run around the stone, and then safely and easily spoon out the avocado stone. Cut avocado into dices, spoon out. Place half of the avocado cubes on lettuce. Add marinated shrimps, then followed by the other half of avocado. Toss in dragon fruit. Done. You can adjust the amount of lime juice to your taste. That does look refreshing. Passion Fruit is not something I normally use but it makes a great presentation so I will have to keep it in mind when I market. I've never seen dragon fruit in the store here in the U.S. (Boston). Is there a good alternative? I got Dragon Fruit at the 99 Ranch Market (Asian Supermarket) in Cupertine California.